Our crystal pillars are very popular. They look absolutely stunning. The pillars are lit and the light shines through the crystals creating an amazing display. You can have them in any arrangement, from one stand to 9 stands and they work with round or square cakes and cupcakes. Your cakes can be decorated with hand made sugar roses, fresh flowers or artificial flowers and the colours of the decoration can be adapted to match the colour theme of your wedding. 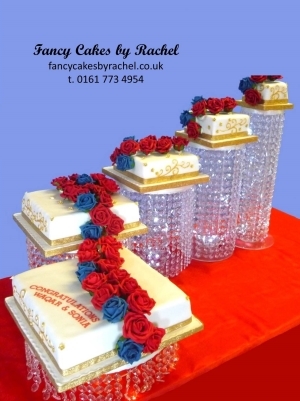 If you would like the crystal pillars for your cake you need to book early as they are in demand. There is a hire charge for the pillars and a refundable deposit. The refundable deposit is returned to you on return of the stands. The hire is for 3 days and if the stands are not returned by the agreed date then further hire fees will be charged for every 3 days after the agreed return date.